Pastor Rob has been pastoring Lakeside since June of 2011. He and his wife Layne have two teenaged sons Caleb and Isaac that attend Central Cambria. Rob and Layne met at Mount Vernon Nazarene University and were married in 1993. Pastor Rob has been pastoring Nazarene churches since 1999. Serving in four churches as both staff and senior pastor. Prior to that Pastor Rob worked in public relations for children services and did radio news for 7 years in the greater Cincinnati area. He enjoys reading, writing, Cincinnati Reds baseball, arrowhead hunting and film making. Layne is a stay at home mom who loves crafts, scrapbooking, cooking and reading. 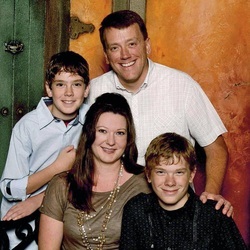 The Osborn family moved to the area in 2011 from the Cincinnati area where they had lived for 18 years. They love the scenic beauty of Pennsylvania. Layne is originally from the Oil City area, where her parents still live.